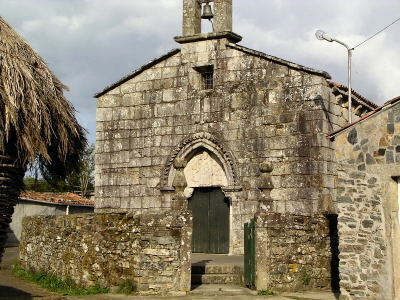 Carolyn and Meredith passed through the two towns of Laboreiro and San Julian whose churches are more than worthwhile to mention. They are quick on their way to Melide the center of Galicia. This beautiful and miraculous tale is perfect for this rustic Romanesque church. Some say, that she returns each evening to the fountain to comb her hair before she retires. 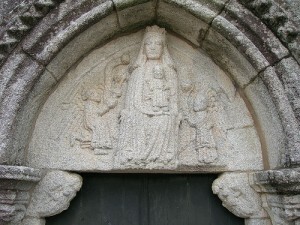 To the left you can see the tympanum that was carved to honor her. The second church in San Julian del Camino is dedicated, as you might surmise to St. Julian. This church was built in the twelfth century in the Romanesque style. A number of historians believe that due to the simplicity of foliates capitals and undecorated corbels suggest that is based off a Cistercian model. Sorry, couldn’t find a picture but have a great story about the region. Legend has it that St. Julian was from this region. When St. Julian was hunting one day, he shot a deer that told him that he would kill his parents before it died. St. Julian to avoid this prophecy, exiled he and his wife for love of his parents. Years later, his parents discovered his location and wanted to surprise him and thus traveled to his house and hid in his house. When he arrived, thinking it was his wife and a lover occupying his bed, flew into a rage and killed them both by the sword. He and his wife then made a pilgrimage to Rome to repent and set up a hospice for travelers. After a number of years an angel appeared to them granting divine pardon. Carolyn and Meredith continue to need your prayers. Check out their blog! Is St. Julian the patron saint of cars? He is the Patron of: boatmen, carnival workers, childless people, circus workers, clowns, ferrymen, fiddlers, fiddle players, hospitality, hotel-keepers, innkeepers, jugglers, knights, murderers, pilgrims, San Giljan, Malta, shepherds, to obtain lodging while traveling, travelers, and wandering musicians. No clue on the cars. I did see that Sts. Francis and Christopher are patrons of cars though. Maybe? Nope didn’t get that. Sorry!